This class is an earthenware handbuilding class for participants at any level interested in the diverse genres of pottery from tableware to vessels for sacred spaces. Demonstrations and projects will focus on using bisque molds as a beginning and soon turn to more complex attachments, altering, and refining techniques. Emphasis will be placed on surface treatment through slip application and sgraffito decoration.We will glaze fire a couple small pieces to practice all the techniques from beginning to end. Shoko Teruyama grew up in Mishima, Japan. She earned a BA in education and taught elementary school two years before coming to the United States to study art at the University of Nebraska-Lincoln in 1997. 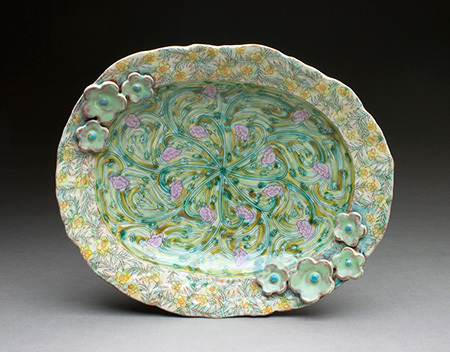 Shoko received her MFA in ceramics in the fall of 2005 from Wichita State University. She finished a three-year residency at the Penland School of Crafts in 2008 and is now a studio artist in Alfred, NY. My handbuilt work is made of earthenware with white slip and sgraffito decoration. I have developed a cast of characters based on experience with human relations. As the characters interact, I want the viewers to find their own stories. The work is seemingly whimsical, but reveals itself to be something more devious and interesting.